Do you need help planning your move? Then our Moving Service team are ready and waiting to help. Consisting of qualified movers and excellent customer services personnel, our removals company in Stockwell, SW8 can help you with all aspects of your move. So as soon as you know that you’re going to be moving, give us a call on 020 8746 4402. Our team can give you a quick, personalised quote over the phone and can help you to find the perfect package for your moving to Stockwell. Our budget van hire deals are available all year round, as are our man with a van services and all-round removals packages. If there is anything that you need help with above and beyond the normal moving packages, our team can even offer a whole host of additional services to help lighten the load. All of our packages can be found detailed on our website and are easy to hire via our professional booking line. If you want someone to call you back then fill in our online form and we’ll have a quote for you ASAP! The area is in the London Borough of Lambeth and is just 2.4 miles from the central station of Charing Cross. 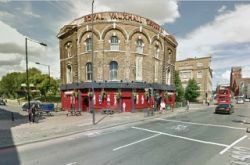 Served by the Victoria and Northern tube lines, it has its own tube stop and is located between the popular Southern districts of Clapham, Brixton and Kennington. Back in the 19th Century, the SW8 and SW9 areas were known for being a middle-class suburb and were largely un-built areas with pretty gardens and open grassland. However, due to its close proximity to the city it soon became built-up and became home to a number of social housing areas with large numbers of houses and flats. Since then it has become known for being one of the poorest areas in London with relatively low house prices. Following a revival in fortunes the district is now considered to be an up-and-coming area and has managed to retain some of its original beauty in the Stockwell Park Conservation Area. Home to one of London’s largest Portuguese communities, it is also a diverse area which has a number of multicultural restaurants, cafes, bars and shopping outlets. Check Out Our Unbelievable Removals Offers Today! Our removals services in Stockwell, SW8 are ideal for all sorts of home and business moves and we can take care of any size removal that you need. Our modern moving vans are available to hire in a range of sizes and can be cost-effective for any small flat or large business removals. All of our movers are also experienced at managing a wide range of relocation projects and can work professionally within any corporate or residential environment. If you work in a special industry or if you have any concerns about your move, then you can even book a consultation with one of our project managers before the big day. All of our Moving Service team members are fully-trained and are on hand to solve any of your possible moving problems before they even arise. If you have a large move to undertake and need some additional help with the final details, then you will also be pleased to hear about our special packing and unpacking services. Designed to help you with everything - from your large furniture, delicate ornaments to everyday household items - our packing services in Stockwell can turn your move into a real win! To hear more about how we can help, fill in our online form or dial 020 8746 4402 for a chat. Moving Service has enabled us to make an unexpected move to Stockwell easily and with peace of mind.